Low glycemic, high protein ingredients leave you feeling full with no crash. We use a special blend of plant-based protein, baobab superfood and all natural ingredients to create these amazing gluten free, vegan nutrition energy bars. Great for weight management, afternoon snack, workout fuel, weekend warriors, serious athletes or even as a meal replacement. Our Mission: Curb the cravings. You deserve to be energized for longer than 30 minutes at a time. At SoLo, we're changing the way we think about food. 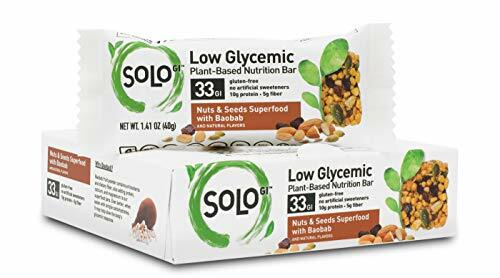 Vegan, Gluten-free, Soy-free, Non-gmo, low GI and Kosher, with no artificial flavors, colors, sugar alcohols, artificial sweeteners, trans fats or hydrogenated oils.